4 bed/ 3 Bath downtown condo - 4 queen beds. Near everything! The Railyard is truly the largest slice of VacationCake that we've done! We are very excited about this property and what it offers incoming guests. The Convention Center is literally two blocks away and of course, you're only about 2 miles from Zilker Park. There's literally no better place to enjoy Austin. You don't need a car, but if you have one we have gated parking for free. There are dozens and dozens of restaurants and bars within a few blocks of this condo...you won't beat it. This condo is fully furnished and has everything you could need during your trip to town. Welcome to The Railyard! Austin at it's finest. The Austin Convention Center: The Railyard will be a hub for the downtown Austin Convention Center, which is less than two blocks away! Since you can walk to everything, you might consider taking the Airport Flyer from Austin Bergstrom International for $1 per person. It picks up and drops off in front of the building every 30 minutes, and will save you the hassle and expense of a rental car or taxi. 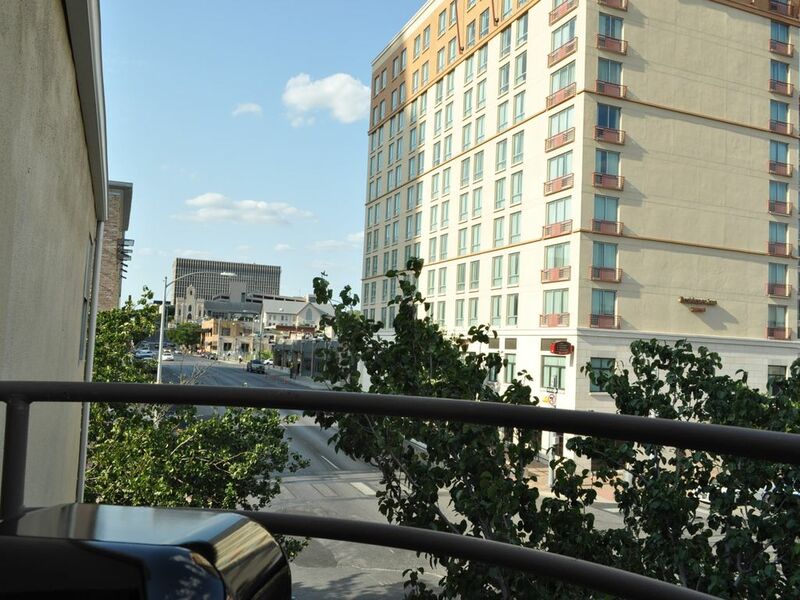 This property is located in the heart of downtown Austin and you can leave the rent car at the airport as you won't need it to explore all the fun stuff to do in downtown! Plus you're just a short jaunt down to South Congress and Zilker Park! VacationCake Rentals provides the utmost in customer care for every one of our Austin properties. You get our customer service and our guarantee that if something isn't right, we'll do everything we can to make it right, right away. Three full bathrooms give you plenty of options. The Marilyn Monroe Room has its own private bathroom, and so does the upstairs area. This property is located IN downtown Austin. Lady Bird Lake is just a couple blocks away. Wahsher/dryer in house. Detergents included. washer/dryer in house. Detergents included. Reserved parking for one car only. Other cars will be on their own. Covered parking. ONE SPOT free. Small dining area - really really set up for a big sit down dinner. We have Apple TV's in each bedroom! Rent kayaks and canoes from our friends at Zilker Boat Rentals! There's a little deck off the living room. If you're bringing your clubs, let us know! Jay used to play golf professionally and has lots of great connections around town! Complex has a pool that is available. All rules must be followed (no night swimming). There's no better, or more comfortable, way to enjoy and experience Austin Texas. Period! Since you can walk to everything, you might consider taking the Airport Flyer from Austin Bergstrom International for $1 per person. It picks up and drops off in front of the building every 30 minutes, and will save you the hassle and expense of a rental car or taxi. Three of us stayed here for a conference and we couldn't have been happier with the location. Just two blocks from the main entrance, it made between-session meals and breaks possible. Common living space wasn't too big but it did have enough seating for us to be comfortable. Each of us had our own bathroom so that was helpful when staying with colleagues and there was enough space to collaborate on projects that were coming from the conference, which is why it was so much better than separate hotel rooms. Plenty of shops and restaurants nearby (sixth is only two blocks away). A grocery store around the corner has some of the basics but there's also a Trader Joe's about a mile away. The place is in good shape and it's clean but could use a few minor updates (paint and stucco touch ups, etc.). Nothing serious, though. We had a minor issue with the wifi, so if you find that to be true, check the router for the numbers. Also remember you're staying in the city so bring ear plugs if street noise keeps you awake. If you're especially sensitive to street lights, a mask might also be helpful (although I found the blinds to be sufficient). Of course, if your'e used to being in the city, you won't notice any of this. Really enjoyed our stay. Great space and enough beds/baths for a small group. 6th street is a short walk away. Also, a cheap uber car or scooter ride to South Congress. Only complaints were that there was a faint smoke smell. Not sure if someone before our group smoked in it (smoking is not allowed) or someone from the below floors do and it rises up to this condo. Another is that Marilyn Monroe room gets a lot of street noise so I recommend the heaviest sleepers use that room. The condo was nice, but maybe not quite as snazzy as it looked in the photos....there were only 3 coffee mugs and four people! I guess it's as they say, location, location, location.....I think that's more what we were paying for than the condo itself. Glad you enjoyed you time and i wish we'd known about the lack of coffee mugs when you were here - we could have dropped some off for y'all! Thanks for letting me know tho - i'll get some over there today! Great location. Walk or a quick Uber to everything. Jay was great with suggestions on things to do. My friends and I enjoyed the location of this condo since we needed to be close by the convention center. We also LOVED having 3 functional bathrooms between all of us! However, as a couple other reviewers have noted, this place is pretty outdated. The paint is old and in many places patched, the dryer barely works, a few of the lights didn't work, and the furniture was scratched and/or broken. There also weren't paper towels, kleenex, or enough toilet paper provided, or extra towels. The master bedroom sheets also had stains on them. Overall, we'd stay here again for the convenient location, which is why I gave this four stars, but otherwise we've seen better condos in the Railyard buildings. Right in the middle of all the action. The Railyard is a primely located four bedroom condo just two blocks west of The Austin Convention Center, smack in the midst of downtown. Other Activities in the area aside from tons of restaurants and bars: you are just a few blocks from the Lady Bird Lake Hike and Bike Trails, and about two miles down to Zilker Park.